“Low exchange prices increase renewables surcharge,” writes the Stuttgarter Zeitung (in German). Experts agree: “The main cause of the increase in the past few years is plummeting prices on the power exchange,” as a recent paper by Öko-Institut put it (PDF in German). First, let’s just view the data. 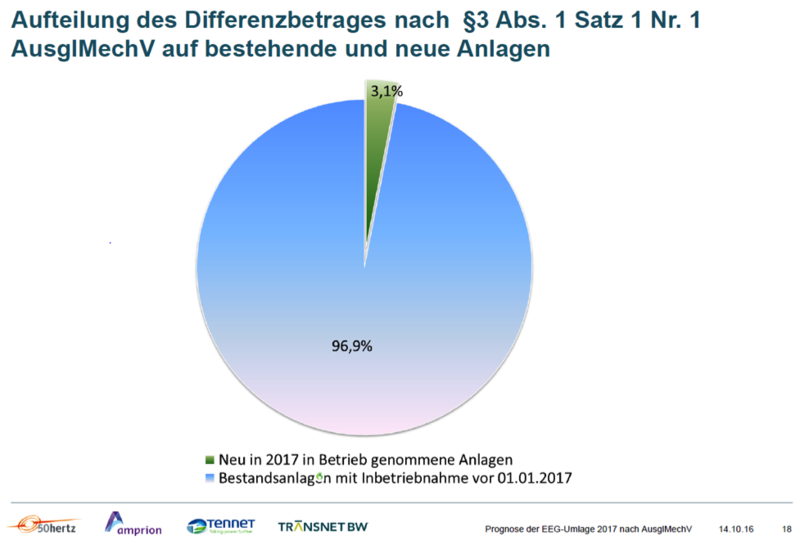 Germany’s four transmission grid operators, who calculate the surcharge, announced that it will rise by roughly 8% to 6.88 cents per kilowatt-hour (in German). Below, we see two things: first, the surcharge passed on to ratepayers has increased twice as fast as the amount paid to generators of the renewable power the surcharge covers. Obviously, there’s more going on. We have marked 2009 above to show the year when the calculation changed. From 2005-2009, the amount paid to generators of renewable electricity (orange line) and the surcharge passed on to ratepayers to cover those payments (green line) increased roughly in parallel. The calculation was simple: divide the billions paid out by the kilowatt-hours consumed, and you get the surcharge. But in 2009, another factor was added: the wholesale spot market. It was hoped that the following calculation would actually bring down the surcharge: billions paid out to generators minus revenue from sales of that power on the spot market divided across the kilowatt-hours consumed. At the time, spot market prices were relatively high and expected to continue increasing (for instance, to around eight cents by 2020 in numerous forecasts). Instead, we have 2.7 cents (see chart below). The policy was implemented for wind power in 2009 and all renewables in 2010. Initially, it seemed that the new calculation might work as hoped; the billions paid out increased by 20% from 2008-2009, but the surcharge barely moved. But since then, wholesale prices have known only one direction: down. Here is the official chart from Friday’s surcharge announcement; the green bars represent the surcharge, whereas the red is the spot market price for wholesale electricity. Falling wholesale prices are good for those who purchase wholesale electricity. Energy-intensive companies also benefit further by being largely (99%) exempt from the renewables surcharge. 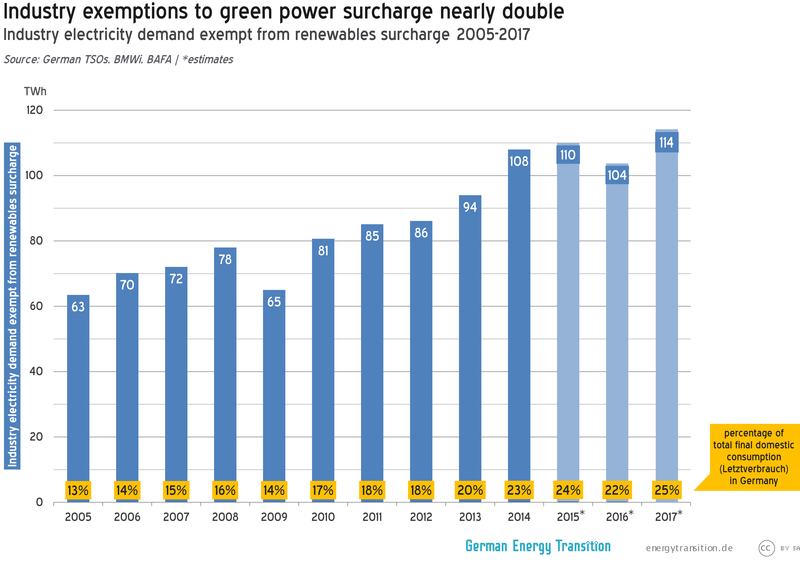 Since Chancellor Merkel took office in 2005, the amount of this industry electricity that is exempt has roughly doubled and may reach a new record high next year, as shown in the chart below. At the bottom, you see the amount that this electricity makes up in terms of total demand. Around a quarter of the electricity consumed in Germany is exempt from the surcharge. In other words, the amount paid out minus revenue from the exchange is not spread across all power consumed, but across a shrinking amount (75% next year). Households and SMEs cover the full surcharge, thereby cross-subsidizing exempt big industry. These two items—the falling wholesale price and the growing amount of exempt industry electricity—together constitute the main reason why the renewable energy surcharge continues to rise. It’s not the amount of new green electricity added; the chart below shows that the new additions only accounted for 3.1% of the total cost impact. 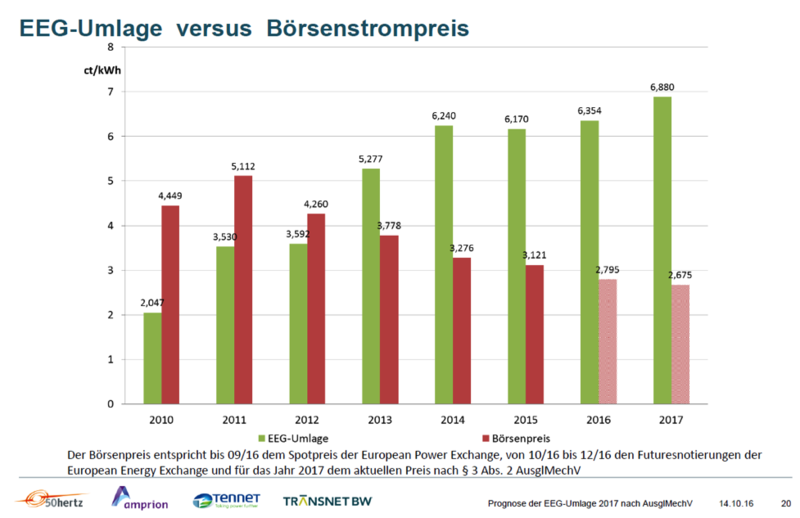 It’s also important to keep in mind, as my colleague Uwe Nestle points out (in German) that the cost of new renewable electricity has been stable over the past four years even as the surcharge doubled. In the chart below, the average cost of new green power in a given year is indicated on the blue line; the surcharge, on the red line. 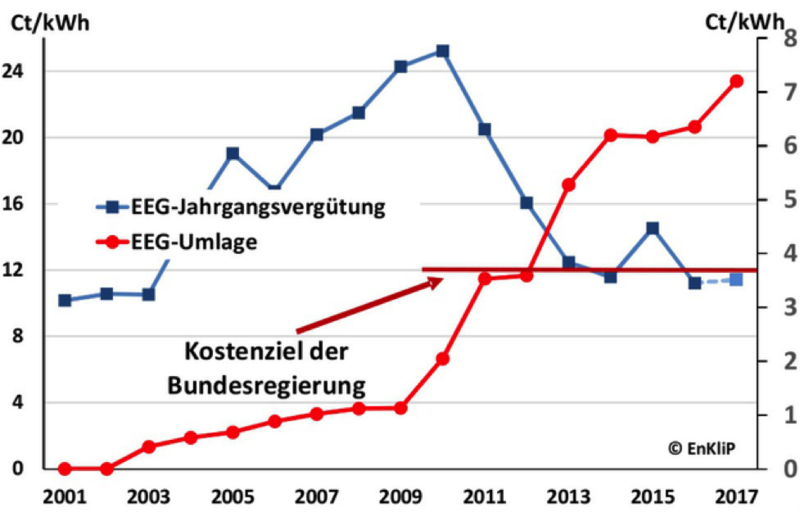 The red bar represents the German government’s cost target. Thomas Gerke (@Zoido4Design) created the new charts and helped with the analysis. It was only recently that wind generation passed nuclear power in TWhs generated annually in Germany. Which roughly means that wind generating capacity has to almost double to replace nuclear in 2022. This will inevitably mean more days when wind and solar generation flood the grid due merit order rules and wholesale price will be zero or negative. Wind curtailment to balance the grid cost billion euros in 2015. There will probably be around 120 GW of wind and solar capacity in Germany by 2022. Last May when renewable generation covered almost all generation needs and prices went negative, capacity was around 80 GW. The prices for the different charges included in the household bills fluctuate, rises being expected with the RE surcharge are leveled by falls in whole sale prices. The energy retailers still have plenty of buffer capacities, the force of competition is still on the increase. It seems to me that it is the right time to shut down as much as possible of lignite baseload, now. Mainly in Lausitzen and Branderburg. Angela should buy the Vattenfall portfolio just to make it closed, it was for free. It propably works faster than anticipated by the incumbent. EPH – who got the lignite assets plus over € 2 billion in cash from Vattenfall – has just blasted this cash money. An “integration” of Renewables into “the energy market” is still the aim of our government. Thus the rules for how the renewables surcharge (what a word!) is calculated were altered in 2009. 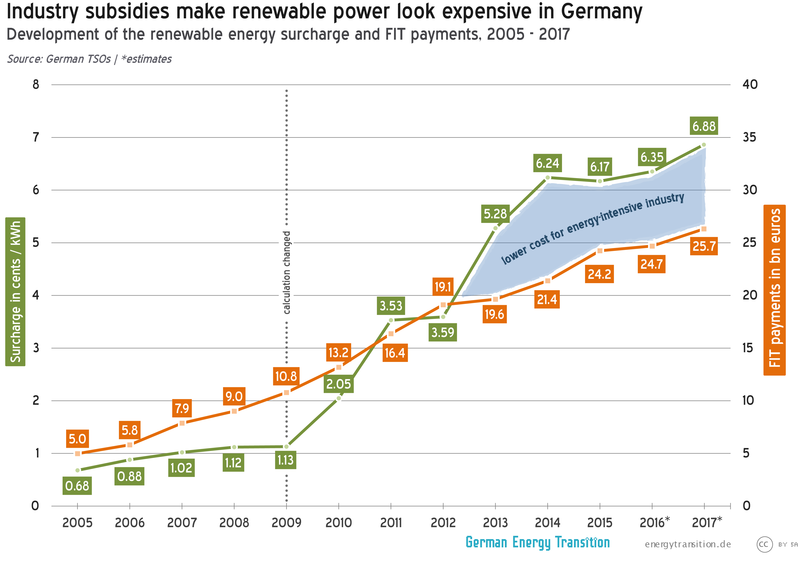 But the dynamics of renewables since then surprised everbody. We need to alter the market rules yet again to make them come closer to the reality we now face. Market rules are not God-given, but man made. They can and must be changed. And perhaps for a CO²-surcharge, an environmental-clean-up surcharge, and a nuclear-waste surcharge that is visible on you electricity bill, while Renewables simply appear as the full cost of electricity that we all share without exemption?